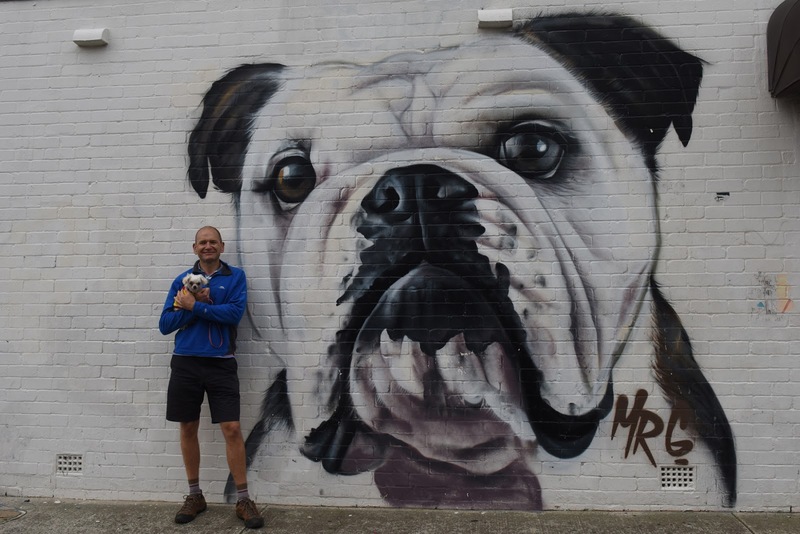 Dr David Bartram and Phil appreciate street art in Bondi. Last week I had the opportunity to spend time with Dr David Bartram, best known as a champion for the mental health of veterinarians. David gained an MPhil and Royal College of Veterinary Surgeons Fellowship in the field, and was director of the UK’s Veterinary Benevolent Fund from 2008-2014. He was awarded the British Veterinary Association’s Chiron Award for outstanding contributions to the veterinary profession, and he’s just an all-round cool guy. I first met David when I inadvertently sat beside him at an AVA conference and he introduced himself. It was one of those moments where you finally meet someone whose papers you've read and cited. 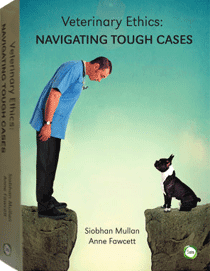 He has been such an important promoter of mental health issues within the veterinary profession and really driven support for vets who need it. A close up of David and Phil. Phil and I showed David around some of Sydney’s beaches and enjoyed a fantastic day of walking, talking and enjoying amazing street art. 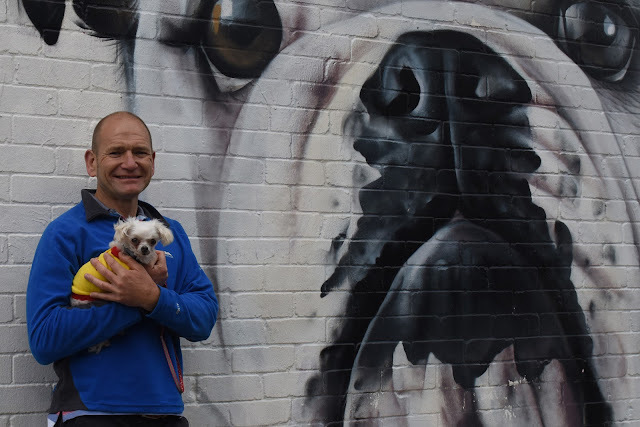 I asked David what his best tips were for enhancing personal wellbeing, and he shared his top tips, which are as applicable to vets as they are to anyone else. Relate – connect with people. This affects happiness more than any other single factor, enabling us to confide and discuss problems, generating a sense of belonging and trust. Exercise. Exercise has been shown to increase mood and has been used successfully to reduce depression and anxiety.5 Participate regularly in a physical activity you enjoy and one that suits your level of mobility and fitness [Ed. As we were chatting all morning we managed to walk a cheeky 12kms! Phil chose to be carried for most of this]. Keep learning new things. Learning encourages social interaction and increases self-esteem and feelings of competency. Set yourself a challenge you will enjoy achieving, rediscover an old interest, sign up for a course or take on a new responsibility at work. Direction – have goals to look forward to. Feeling good about the future is important for our happiness. We all need goals to motivate us and these need to be challenging enough to excite us, but also achievable. If we try to attempt the impossible this brings unnecessary stress. Choosing ambitious but realistic goals gives our lives direction and brings a sense of accomplishment and satisfaction when we achieve them. Resilience – find ways to bounce back. Learn to challenge automatic negative thoughts, dispute pessimistic explanations and reframe situations in a positive light.9 Try to keep a sense of perspective in life. There are negative feelings in life but experience shows that these pass; we learn from them and begin to enjoy life again. Situations that seem impossibly bad can turn out better than expected, whilst goals that seem incredibly important at the time are only a small part of life. We can experience adversity and come through it. Do not be lured into the trap of ‘perfectionism’ – self-defeating thoughts and behaviours associated with unrealistically high goals. Be satisfied with ‘good enough’; only going for ‘best’ when it really matters. Acceptance – be happy with who you are. Care solely about other people’s approval and you will forever be their prisoner. Identify your personal talents and character strengths and live life in such a way that enables you to use them to the fullest extent.8 Give yourself permission to be human: rejecting one’s emotions, positive or negative, leads to frustration and unhappiness.